Who doesn't love a good meme? You know, those funny viral videos, images and ecards that seem to take over the Internet (and your Facebook feed) for a week or two and then disappear into web. Everyone likes to join in with their own version of what that apparently-drunk baby or too-serious-for-you cat has to say. Surprisingly, the review section of Amazon products is one place for people to indulge in their love for memes. Whether the products are Internet famous before they were listed on Amazon or quickly became infamous for reasons you'll discover below, each one of these has become the focal point of viral humor on the world's biggest retailer site. 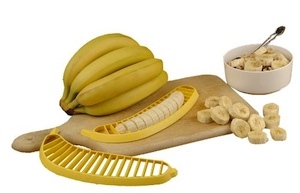 Easily the coolest thing since sliced bread, the Hutzler 571 Banana Slicer slices an entire banana in one quick motion! Imagine the time you'll save every single morning by slicing your banana in one shot, rather than using a plain old knife! Plus, as the manufacturer points out, children just love slicing their own bananas! Apparently all the cool kids are doing it these days. Such a useless item quickly became a target for Amazon reviewers. "What can I say about the 571B Banana Slicer that hasn't already been said about the wheel, penicillin, or the iPhone.... this is one of the greatest inventions of all time!" "No longer consumed by seething anger and animosity towards thick-skinned yellow fruit, I was able to concentrate on my love of theatre and am writing a musical play about two lovers from rival gangs that just try to make it in the world." "Once I figured out I had to peel the banana before using - it works much better!" Can I get that with a side of "What the what?" 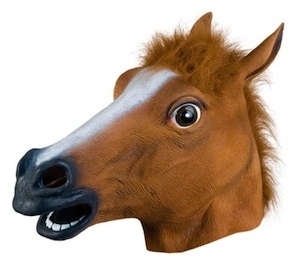 Quick, what three words immediately come to mind when you hear "horse head mask "? "Awesome conversation piece," right? Right! If disturbing your friends (and anyone within sight of you) is your idea of entertainment, then this latex mask has your name on it. Just pony up some cash and you'll be horsing around before you know it! Amazon reviewers couldn't wait to rate this Godfather prop reject. "Last year I dressed as Sarah Jessica Parker for Halloween, and this really helped pull my costume together." "This mask imbues the wearer with super-human abilities. The power to make everyone around you feel awkward and uncomfortable being first among them." "Compared to other horse masks, I'd imagine this one has more horse maskliness than other horse masks on the market today." But what really makes this meme special are the 700+ images customers have posted of the mask in action! Presidential candidate Mitt Romney certainly put his foot in his mouth during one of the 2012 Presidential debates when he said, in response to his office's policy on hiring equality, " ...they brought us whole binders full of women." Suddenly everyone and their mother wanted to buy "binders full of women." Women (and men) upset with the idea of gender inequality went straight to Amazon to express their viewpoint. 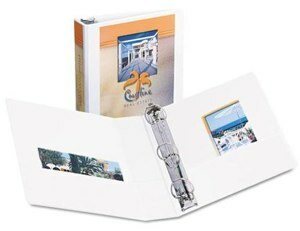 And what better place to do it than in the 1,295 reviews for an ordinary Avery binder . "As a wife and mother, I LOVE this binder. It keeps me in my place, allows me to get dinner ready on time, AND only costs 72% of the more masculine version...Full disclosure: I submitted this under my husband's account, with his full permission. He is the head of our household, and the owner of the binder." "While this is a lovely, multi-purpose binder, IT DOES NOT COME WITH WOMEN. Presumably one is expected to find women on one's own, or contact women's groups who are supposedly eager to help stock your empty binder with women." made this really useful binder." 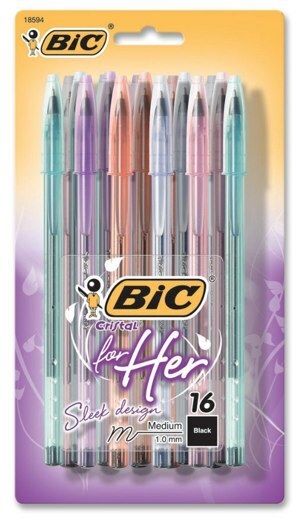 Outrage over how women are perceived and marketed not only hit Avery's products (though not for anything they did), but also that of the pen maker, Bic (which was admittedly more deserving.) Bic's line of BIC Cristal For Her Ball Pen attempts to create a completely new market for pens, when, well... there really isn't one. With a thin barrel to better fit a woman's hand, reviewers all agree that these pens are perfect for writing out recipe cards and love notes to Twilight hunk Robert Pattinson. Save manly things like math and science for the big boy pens real men use. "It has given me soft skin and manageable hair and it has really given me the self-esteem I needed to start a book club and flirt with the bag-boy at my local market...Those smart men in marketing have come up with a pen that my lady parts can really identify with." "I see this comes in a sleek design. But as a "full-figured" woman, do these pens come in "curvy and carefree"?" "The best thing about this pen? It looks so stylish tucked behind my ear while I'm perched on the corner of my boss' desk flirting with him." Perhaps the biggest success of the Amazon Review clan is the first. 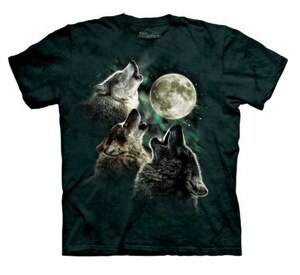 The The Mountain Three Wolf Moon Short Sleeve Tee , gained a quick following after one tongue-in-cheek review in 2008. Every one after that joined in on pointing out the magical, mystical powers of the shirt which will ensure even the dorkiest guy on the planet will attract women. "This shirt has changed my life! Before, I couldn't walk through the aisles at Wal-Mart, graze on the buffet at Sizzler, or even take in a round at my local miniature golf course, without people pointing and saying, "Hey, you're that Zulu guy from Star Wars, aren't you?" Even if I wore sunglasses, I'd still get mistaken for Yoko Ono." The real fun, though, is that as the shirt's infamy grew, tons of memes and parodies started rearing their ugly heads. Star Wars' online store sold a "Moon Over My Ewok" shirt with Ewoks and the Death Star. A Minecraft parody sported Creepers instead of wolves. There's even a Grumpy Cat version with three headshots of the popular sourpuss grimacing at the moon. Oddly enough, the 3 Grumpy Cat Moon shirt is available for purchase on Amazon. Ah, the circle of life. And if you just can't get enough of Three Wolf Moon (and you know you can't), this video may be the ultimate homage. Which review is your favorite? Do you have any to add to these clever quips? Let us know in the comments below. Have you read the Amazon reviews on the Bible? Hysterical. Hadn’t seen that one before. Thanks! Here’s another one for you, the paperback book A Million Random Digits with 100,000 Normal Deviates (link below). “The book is a promising reference concept, but the execution is somewhat sloppy. Whatever generator they used was not fully tested. The bulk of each page seems random enough. However at the lower left and lower right of alternate pages, the number is found to increment directly.